A lovely article in the 'Geographical' magazine for this month, which explores the legacy of Rita Gardner, who is retiring as Director of the Royal Geographical Society. I've worked with the RGS, writing educational materials and leading CPD at Exhibition Road, for around 10 years, and the GA worked closely with the RGS-IBG during the Action Plan for Geography (2006-11). Rita was also there when I was awarded my Ordnance Survey award back in 2008. 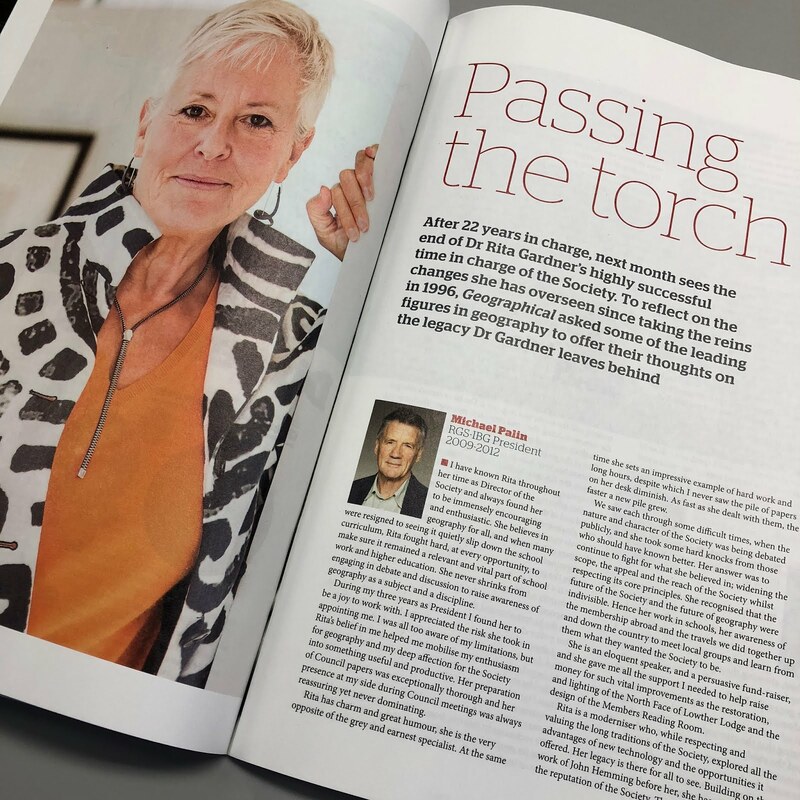 There's a few words in the article from David Lambert, alongside recent Presidents including Michael Palin, Judith Rees and Nicholas Crane. I wish Rita a very happy retirement, but would guess she will continue to support the wider geography community, alongside travelling and photography. See some of Rita's photographs in the current exhibition at the RGS. I look forward also to seeing how Joe Smith leads the next stage in the development of the RGS, and hope to continue to be involved in some way. It was really positive to see that Joe was at the GA Conference reception on Thursday night, which I hope is a sign that the GA and RGS will (continue to) work more closely together.